A beautiful visual exploration of the strange sequence of numbers, nowadays called after the great 12th century Italian mathematician, Leonardo of Pisa, better known by the abbreviation of the Latin for ‘son of Bonacci’, Fibonacci. The Fibonacci sequence crops up in the most unlikely places in nature and society. The relationship between the sizes reflects the golden ratio, which underlies the Fibonacci sequence. 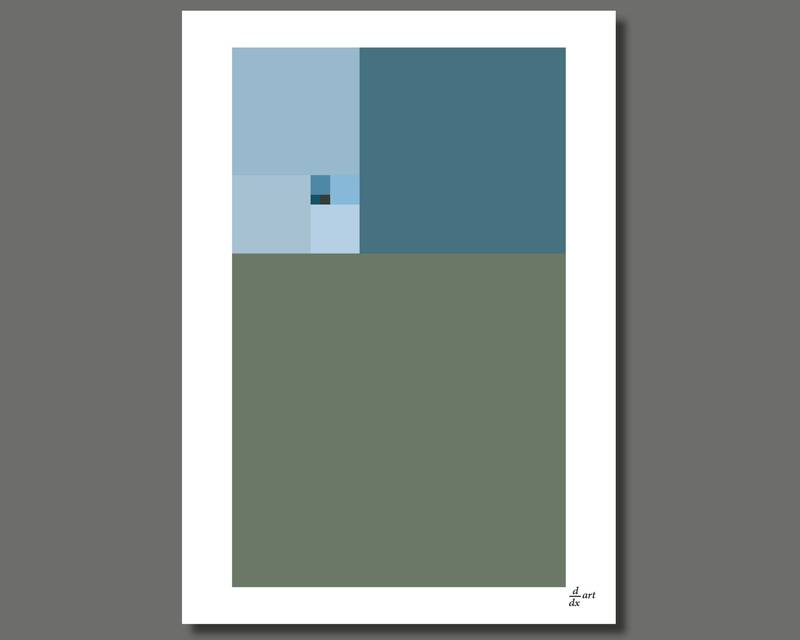 Fibonacci Winter is one of a series of four prints based on the seasons. Designed by David Lawrence, d/dx art prints are created on heavyweight Canson Infinity artboard produced at the centuries-old Arches paper mill in France. This superb artboard is acid-free and uses no optical brighteners to degrade over time. Ultrachrome K3 inks provide vivid colours which will last without fading for many decades in normal conditions. The robustness of the paper makes DIY framing a simple matter. The prints are standard European A4 (210*297mm) or A3 (297*420mm) in size. They are packed flat in crystal envelopes with cardboard stiffener and posted in a rigid container via Royal Mail first class. Prints can be initialled "D." using the customization option at the time of purchase. Just add 'Initialled please' or something similar!